I don’t think enough people writing in Google Docs know one killer way to use it is going full-screen while setting the view at 150% size to work in a distraction-free space. I mention it to anyone who will listen, and the idea of changing the default 100% view is almost always a complete shock to others that never considered changing it before. It’s honestly the only way I can focus on writing these days. 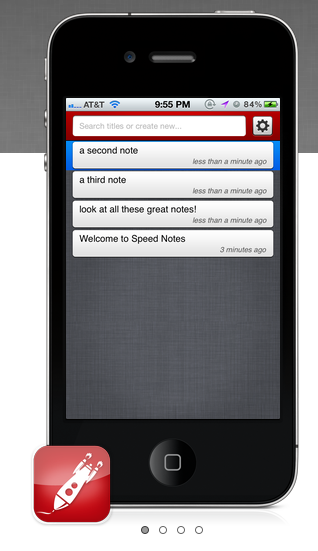 I tried out this app called Speed Notes the other day (thanks to a mention on MetaFilter Projects). It's pretty simple, you tie the app to your Dropbox account, it creates a Notes directory, and then you can quickly create a new note by giving it a name. You get a blank document to fill with information at that point, which is pretty much exactly like the way the default iPhone notes application works. The great thing about Speed Notes vs. Apple's Notes is that everything is on Dropbox and they are simple text files. This means they are instantly mirrored on every other computer you own. This also means you can make changes and additions to those text files from any other computer, and the information will be reflected on your iPhone. I've found that in the last month or two of using Speed Notes I'm frequently starting notes and to-do lists as new items in the app while I'm out, and when I get back to my desktop computer, I end up modifying and fleshing out the files there, and I'm often looking back over the notes days later on my phone when I need them. It's useful for grocery lists, to-do lists, travel information you need for a trip, etc. You can even share your notes directory with others to let them make modifications to the files too. Overall, a great little app I didn't know I needed until I had it, and it's only $1.99. Totally worth every penny if you're a Dropbox user and fan. I've been a huge fan of Kickstarter since they launched just two years ago. My friend Andy was one of the first employees, I got to put my money where my mouth is when I became a small investor in the project, and I do run a curated page of all MetaFilter members with Kickstarter projects. All those disclaimers aside and though I've yet to launch my own Kickstarter project, I wanted to post some tips on having a successful project on Kickstarter from someone that has funded almost 30 projects. These are trends and tips I've noticed in watching a few dozen projects succeed and fail over the last two years. I know, this is obvious, but it's worth stating that every successful project on Kickstarter starts with a great idea for a thing that no one has seen before and does something cool. You can get every other tip right and still fail if you mess up this core thing. A compelling idea is unique, it addresses a need that nothing else does, and it helps if it does so in a clever way. Now that can be an iPhone tripod mount or a movie about BMX, but it helps if it adds to the world as being a new form of creativity. The number one reason I'd say projects fail is that they ask for too much money. I know product design and manufacturing doesn't come cheap but if you have a small little item you want to produce that will have a final price of maybe $20 or less, don't be surprised when you have trouble raising many tens of thousands of dollars for it. Whatever you need in terms of money, be sure to explain in as much detail possible how the money will be used and what it will be used for. Sometimes I've seen too-high $ projects get more funding when the creators came back to explain how much equipment was really necessary and what the going rates were. This applies equally to products as it does to things like film or music production. If you asked a random person on the street if <$5,000 was enough to record and engineer and album in this day and age, I think you'd get agreement. If you said you needed $25,000 to make a record, I think most people would say that is too much. I've seen a lot of film projects ask for upwards of $100,000 for paying a team of editors, but very few of those projects get funded and I think that's because people are used to seeing smaller films done in something like Final Cut or even iMovie and would prefer to see them done for much cheaper. Here's something I've noticed in a few projects: they have a great idea for a cool thing that I want to help fund (mostly because I want one of the things they will produce), and they are asking for a significant amount of money, but their rewards are structured in such a way that you get one of the things they are producing for a small amount of money. So imagine you were making a thing and you needed $15,000 for it, but if you gave just $10, you got one of the things. You could offer more copies for $30, $50, and $100 pledges, but imagine that a normal person only has use for one of these things. Chances are, you're going to have trouble finding 1,500 people on the internet that want your thing in the month or so you run your Kickstarter campaign. If instead you were giving away the thing at $30, you'd need just 500 people to get you to your goal. I find I fund most projects in the $20-40 range, which I consider a "what the hell" level equivalent to a single visit to an ATM (your mileage may vary on what you feel comfortable with). Given that level I hit most projects at, I feel a sense of doom for a project when I get a digital download or an item mailed to me for on $5-10. I've funded projects in the $100-500 range when there has been some sort of amazing reward attached to it (either a special edition version of an expensive item produced, a reward with retail value near that amount, or some special acknowledgement of my backing), so try and offer a range of rewards with the "sweet spot" in the $20-40 range. Also, don't forget to offer bigger rewards with more compelling, customized options. The more creative you are on the upper end, the more likely you are to get someone actually giving above and beyond the normal backing amount. If you are producing an item that will eventually be for sale, by all means offer that item at a reward level slightly below retail. That way, people can not only back your project, they'll get one of your things, and on top of all that, they'll save a few bucks on something they already wanted anyway. It's win-win,-win. I've watched a lot of Kickstarter project videos and I can definitely say that the better your introduction video, the more likely are to get funded. A good video shows off the product or creative work you intend to produce, explains where the money is going, and offers up some entertainment value. I am I is a great little uncut funny video about a movie production and Allison Weiss did a funny simple video at home that pushed her project to over 350% of her goal. The Loog Guitar video does a great job explaining what the project is about and relates the creator's passion for the project, pushing it over 400% of its goal with the most popular reward level being $150. Even if you can't be funny or don't even want to be on-screen, just doing a voiceover video of screenshots and/or photos about your project can be enough if you explain what your idea is, what you'll do with the money, and what rewards are available to backers. The Kickstarter blog had a great 2-year anniversary post last week where they compiled stats on all projects to date. There are tons of lessons and tips there, like getting a previous backer to back your project being very important. I tweeted the other day that I've been getting a steady stream of cool stuff in the mail to the point where it felt like Kickstarter was becoming a store. I've bought a lot of toys and things for my daughter on Kickstarter and the way I do that is by doing to the "Ending Soon" page. These are all projects about to be funded and I'll check that page about once a week and if something is fully funded and they have a cool reward in my "what the hell" pledge level of $20-40, I'll often kick in some money. It also means the month or two campaign time is cut to almost nothing, getting rewards into your mailbox that much faster. Answer questions quickly and honestly as they get posted to your Kickstarter project. I've seen some project comments/questions languish as the creators were nowhere to be found, while I've seen other project creators relish the ability to keep their project up to date and answer questions quickly and fully when asked by potential backers. Overall, I'd say if you had a project fail on Kickstarter, the best thing you can do is to try and cut your costs and scope of the project accordingly, and relaunch it. I've seen several projects fail at $10,000+ and come back in a slightly more limited form for less than $5,000 and get funded fully. I'm halfway through a big bet and I just weighed in at a tad over 210 pounds this morning, right on schedule for winning my bet. Getting down to 220lbs from 230 at the start of the year was easy, but the rest of the pounds were much harder. I'm now on a pretty good weight loss streak of a couple pounds per week with no end in sight. Different things work for different people but I thought I'd share what worked for me in the hopes that maybe one or more of these tips will help your own weight loss as well. A good starting point is reading the bible for geek weight loss: The Hacker's Diet. It's a simple free book you can get a copy of online and read on almost any device. It's pretty basic stuff, talking about how food equals calories equals pounds and how to count and curb calories while exercising to further your calorie deficit. The book does a great job of laying out a simple engineering approach that doesn't concern itself with what foods you eat or how you prepare them or even what exercise you choose to do, it's all just simple math on how to make small changes to lose a pound or two a week to meet your goal and maintain your ideal weight. The only downside to the book is that it was written a long time ago and you should ignore all the mentions of spreadsheets and the screenshots of early Excel running in Windows 3.1 because thankfully there are iPhone apps and online apps that can keep track of your data much easier. I've heard many times in many places that you shouldn't live and die simply by the scale and that you should instead plot your daily weight on an average curve that smoothes out the daily fluctuations in weight. I never had the patience to do this until recently but now that I have I fully understand the benefits. It's also important to limit your variables by taking your weight at around the same time every day, with the same scale, under similar conditions. I do this every morning right after I get up. I usually pee, get undressed completely, and take my weight. I've been doing this for almost a year and I used to get depressed easily if I happened to shoot up a few 10ths of a pound one day. It wasn't until I switched to a moving average that I started to see the light. It takes a couple weeks to get enough data points but trust me that it is worth it. There are many explanations of why one would use a moving average, but I'll just say that it covers your weight trends and lessens the daily fluctuations. This means if you drop 0.1 pounds every day for a week then one morning you weigh in at one full pound heavier than the previous day, your entire week wasn't shot that morning because you'd still be trending downwards. If you stick to your plans you'll often see weight continue to go down even with the occasional hiccup. After trying out several online tools and apps, I like physicsdiet.com the best. It gives a nice history graph and you can use the basic green-means-good, pink-means-bad to continue exercising and watching what you eat. Sometimes it can be frustrating if you suddenly lose a few pounds and your moving average still reads a pound or two higher than what the scale says, but having a slow moving average has done wonders for my happiness each day. An average weight loss trend removes a lot of the emotion from daily weigh-ins, in a good way. When I first started trying to lose weight I hit a plateau early on. I was doing more exercise but I wasn't losing any weight for months on end and it wasn't until I realized that I was eating larger meals to counteract the exercise that I solved the plateau problem. Being mindful of your eating for me means a few things. First, I try to have small dinners, early in the evening. Secondly, at every meal and especially dinner I stop every few minutes while eating and take a quick assessment of how full I am feeling. In the past, I've pretty much just shoveled food into my mouth until a plate was cleared, but now I frequently have small light dinners with 14 hours or so before breakfast the next day, which really helps lower my daily calorie intake. Another quick tip came from somewhere deep in Ask MetaFilter: if you're presented with some large meal, rich food, or incredible looking dessert, ask yourself if you'll remember it two weeks from now. If the answer is yes, by all means go ahead and eat it and enjoy it and think back on how wonderful it was weeks from now. If the answer is no, put the fork down and go do something else. I know a lot of friends that have done the Body for Life thing have told me to not just try a diet and not just try a workout, but change your schedule permanently so you can do healthy things forever and it's true. My big win on losing weight was increasing my exercise but doing so with an activity I love to do (cycling). So it wasn't a chore to increase my weekly miles on a bike, it was a chance to spend more time doing something I loved. Even if you hate gyms, hate working out, hate running, hate cycling, and hate jumping rope, you have to find something physical you love to do in order to make it work. Once you find that exercise embrace it and use enthusiasm to help burn some extra calories. Overall I'm really happy with my 20lbs lost since early this year and I'm looking forward to losing another 15lbs more before I try to stabilize my weight below 200lbs. A lot of it comes down to self-control — there are so many opportunities every day to gorge yourself on free office bagels, high calorie coffee drinks, and rich desserts that it's often hard to say no, but with good feedback and some clear goals it makes it much easier to say no. I’ve been using flickr on a daily basis for over two years. Today I followed a link from someone’s blog and landed on a page I’ve never seen before, and it rocked. It’s simple, but I didn’t have any idea it existed. It’s the “detail view” of photosets, which is so much more useful for getting the gist of a gallery that I wonder why it’s not the default view. See how much easier the detail view is? No more squinting at little thumbnails, you can instantly scan everything in a set without having to click on anything. Just add “/detail/” to your flickr set links when sharing a gallery. Your readers will thank you.